What's New At The Magical Widmer-World in Pleasanton? When it comes to holiday festivities, no one puts on a show that gets everyone in the spirit quite like Widmer-World. As one of the Tri-Valley's most popular lights displays, anyone living in Vintage at Pleasanton, CA, has front row access to this premier event. Here's what you can expect to see this year during this wonderful holiday experience. For those unfamiliar, a retired software consultant by the name of Bob Widmer puts on one of the most spectacular light shows you could possibly imagine right on his own property. This event began back in 1981 when the Widmer family started creating wooden displays and moving carousels as an attraction at his home. As his family has grown over the years, the added helping hands have allowed this unique event to turn into one of the largest light shows around. In fact, the show has grown so large that it was featured on The Great Christmas Light Fight on ABC in 2015. You can find Widmer-World at 3671 Chelsea Court in Pleasanton, California. For those of you using GPS, the zip code is 94588. The display is open every night up until December 31st from 6 p.m. to 9 p.m. There's still plenty of time to catch this west coast marvel, but don't wait too long! Direction to Wildmer-World can be found on their site via this link. Surprisingly, walking through this winter wonderland won't cost you a dime. Cash donations are accepted to help offset the cost of operations. 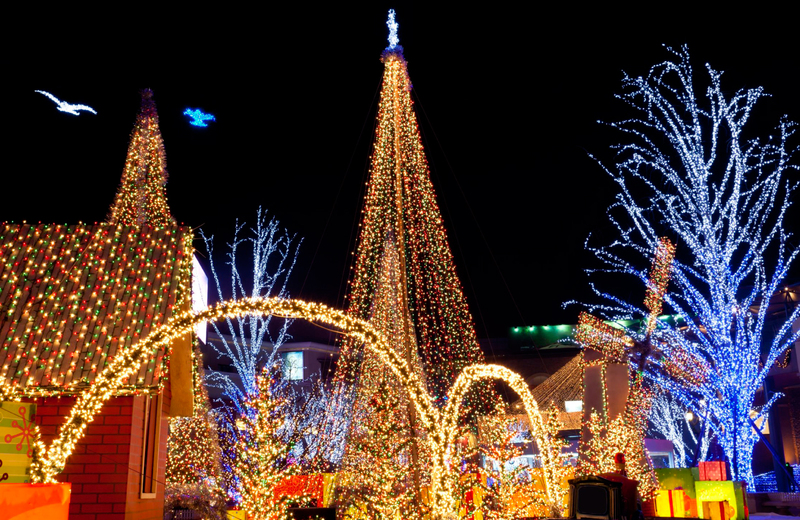 Aside from the lights and works themselves, which certainly create quite the Pacific Gas and Electric bill, donated funds help provide a Santa Claus each year that children can take free pictures with. Any funds that exceed the operating costs are distributed to the family's favorite charities, so it's all for a good cause. This holiday features the addition of seasonal-themed inflatables as well as a large Ferris Wheel to the front yard of Wildmer's Fairlands home. Visitors can also expect a few larger than life surprises in the backyard this time around, according to Wildmer. There are three new scavenger hunts that will change each weekend, keeping fans guessing as to what might come next, as well. The holly jolly symbol of Christmas himself will appear Friday and Saturday on the following dates for complimentary photos. The scavenger hunt will not take place during St. Nick weekends due to the larger crowds. All of that traffic causes a safety concern for children. This spectacular display is just a short distance away from Vintage, a series of new luxury apartment homes in Pleasanton. As much of an escape as it is a destination, this contemporary community is a place where beautifully appointed homes, a collection of resort style amenities, rolling lawns and parks, and boutique shops combine to create a distinctly new take on the leisure lifestyle. Spacious floor plans feature the finest in modern furnishings from stainless steel whirlpool appliances to smart thermostats. Quartz kitchen countertops are accented by today's top designs in cabinetry and lighting. Wood style flooring gives way to walk in closets, as well as expansive balconies. Walk-up entries and private garages create the unique feeling of home, while central air, icemakers, and full sized whirlpool washers and dryers redefine the constructs of apartment living. Amenities are catered to the leisure lifestyle. The sophisticated resident clubhouse and outdoor social veranda perfect for mingling, while a resort pool and spa terrace complete with cabanas offers an escape from the stresses of the day. An outdoor kitchen and lounge allows you to discover your inner chef, or you could perfect your swing on the vintage greens game lawn. A wellness 24-hour fitness club combined with a yoga and Pilates studio offer rigorous workouts, as does the bike storage and workshop room for rides into town or commuting to work. The lobby lounge and business center is perfect for the entrepreneur and CEO, while a demonstration kitchen caters to private parties for your friends. Billiards and shuffleboard create fun evenings, whereas the pocket parks and courtyards offer tranquil escapes. Furry residents can treat themselves to a day of pampering at the pet grooming spa, then stroll around and take in the fresh air within the bark park. Package acceptance and parcel lockers make receiving your Amazon orders a breeze, but you could always choose to venture into the retail plaza with its 30,000 square feet of conventional retail, fine dining, and premier services. Vintage places you in the heart of a thriving Bay Area location. Moments away from your front door lies renowned arts and entertainment from Studio Seven Arts to the Rubino Estates Winery. Retailers ranging from Lululemon Atletica to Pure Barre offer high-end shopping extravaganzas, while a variety of parks and golfing greens offer the best of California's nature scene. Exquisite dining experiences such as Barones, Chiantes Reserve, and Lokanta Mediterranean Bar and Grill make for the perfect evening out, especially when coupled with the refined yet vibrant nightlife of the area. The top-rated K-12 school system boasts a cream of the crop status here in Pleasanton, giving families the reassurance that their little ones receive the education they deserve in a safe and enriching environment. Meanwhile, near instant access to the BART and ACE trains make for simplistic commutes and easy access to the entire Silicon Valley. Every accommodation has been thought of and implemented for our residents, providing them with a whole new meaning of luxury living. These homes are more than just another apartment for rent in California, they're redefining the concept of the Silicon Valley lifestyle. We invite you to explore a new way to enjoy the escape a home can provide, while taking in the best that Pleasanton has to offer at the same time. Welcome to Vintage.